Adorable aeroplane slippers for your children's comfort. They will never leave your little one's side. Safe: designed without laces or ties, our slippers are safe for baby. Breathable: genuine leather ensures freshness and comfort for baby's feet. The colours used are non-toxic . The elastic on the slippers is quite large, which is ideal for children who wish to put on their shoes on their own , but also for babies with strong enough ankles. The leather used has also the property of being thermo regulator : the feet are cool in summer and warm in winter . Starchild slippers size rather big. Wash by hand or in the machine (with washing of the same colour) at a low temperature. Place a milk soaked cloth on the leather for a renovator effect. To maintain the anti-slip sole side, simply brush the suede to remove all the dirt making it smooth. 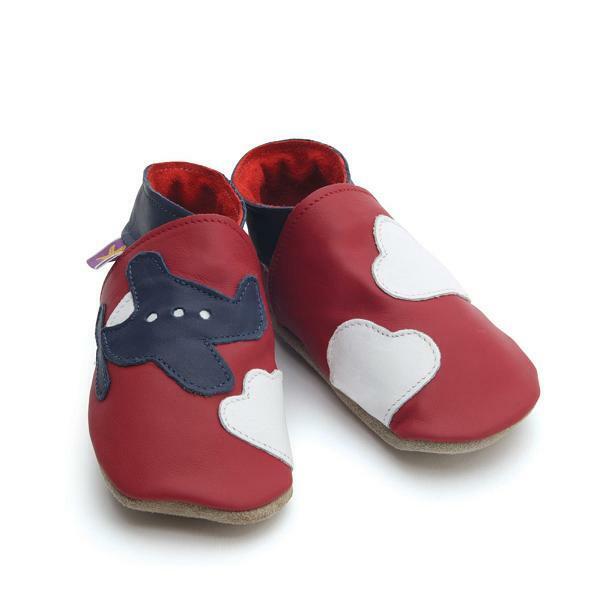 Starchild is famous for its soft sole leather baby shoes and colourful slippers. They are made with love and creativity from 100% leather. The elastic straps and Velcro closures keep Baby's socks on and the shoes really do stay on! Therefore Starchild shoes and slippers help babies gain confidence while taking their first steps. Another key feature: The thermo regulating properties of the leather keeps Baby's feet warm in winter and cool and dry in summer. Each pair is lovingly hand made in England in a traditional shoe factory. They make appealing gifts and are much loved by adults as well as children.